Super Heros and Super Sports – What’s Yours? This morning as I anticipate the official opening of the Olympic games, I am thinking about my Super Sport. If I was able to create a new sport and use super human powers within the game, what would it be? Living near San Diego, and greatly exposed to Comic Con finishing just before the Olympic games, it seems my imagination is haywire. Or is it? This past week I enjoyed an in-depth conversation with my adult son about super heros. The conversation, primarily about Batman, began with the fact that he is the only hero that is fully human, a vigilanty really, but all for GOOD. Batman became the caped crusader against crime because of the murder of his parents.The discussion was prompted by a news piece with Dr. Langley about his book, Batman and Psychology: A Dark and Stormy Knight. The conversation was fascinating and imaginative. My son thinks Christian Bale makes the best Batman. Yet, he agreed with me that Adam West is in a class by himself; “he created the character”. When I was a little girl, I tied a beach towel around my shoulders and pretended I was Batman. I’d run around singing “na-na-na-na-na-na-na, Batman!” My version of the television theme song. My younger sister’s name is Robin so I was always Batman. Of course, that meant she got to say the cool words like, “Holy Smokes Batman”. But Batman was not my first superhero. Mighty Mouse and Popeye took center stage in my early years and later Wonder Woman left her impression. It wasn’t until I reached my mid thirties that I discovered my affinity for these super heros was a part of my DNA. While I tried out for every sport in school, once past the softball and volleyball teams of junior high school, I wasn’t competitive. It seems I was not meant to discover my super sport until later in life. Girls were not allowed in the weight room where I attended school. When I finally discoverd the gym, little did I know I would discover my true strengths and the inner most depths of my being. There really are no words to describe being able to perform something that comes purely and naturally from one’s physical and mental abilities operating at maximum for one goal – lift the weight, kick the ball, swim, run, jump . . . . So with today’s opening of the Olympic games, my adrenaline pumps with the athletes. I am very excited! So excited, that I am thinking about Super Heros and Super Sports. Let the games begin! 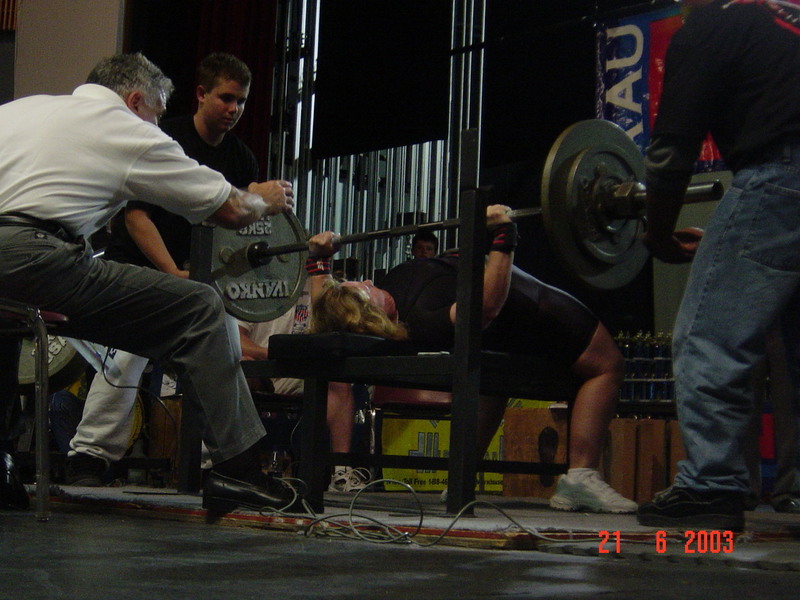 Gretchen M. Ashton, bench pressing 218 pounds in 2003.